What you’re looking at up there used to be a Toyota Prius, and, yes, it’s crammed into a doorway of a building. The bizarre location for a Prius happened as the result of a crash in Indianapolis, where a teenaged driver ran a red light and crashed into a building. The driver is in critical condition, but responsive. The Prius, less so. According to Indianapolis-area station WTHR, the crash happened yesterday about 7:30 p.m.. 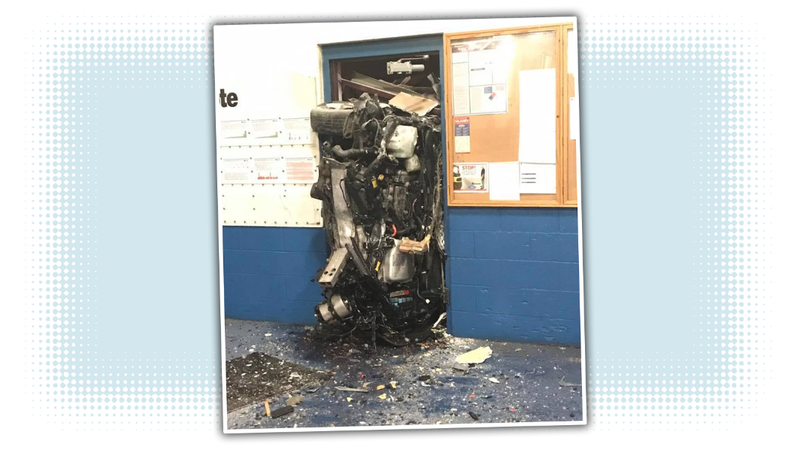 The Prius was speeding, and the driver ran through a red light, then hit the traffic signal pole, which sent the car careening into the Bodycoate Thermal Processing building. Somehow, the driver was actually able to exit the vehicle, which is pretty astounding, looking at that wreck. Nine workers who were working inside were uninjured, but I suspect very, very surprised. Remember, it’s possible to do something stupid in a Prius just as well as in a Mustang or something.